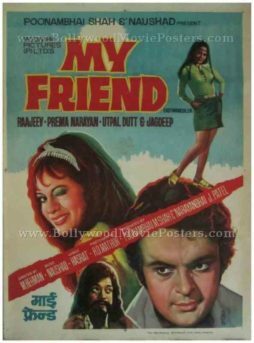 Vintage Bollywood poster for sale of the Hindi film, My Friend (1974). This is an actual surviving vintage Bollywood poster of the 1974 Hindi film that starred Utpal Dutt, Rajeev, Prema Narayan & Jagdeep in prominent roles. Printed and circulated during the first release run of the film (somewhere in the early 1970s), this vintage Bollywood poster was designed and printed for publicity of the film but never ended up being used. This vintage Bollywood poster for sale was originally designed in hand painted oil on canvas format by one of the finest Bollywood poster painters of his time, C. Mohan of Studio C. Mohan fame. His trademark “vertical” printed signature is seen on the bottom right hand corner of this vintage Hindi film poster. True to Bollywood poster artist C. Mohan’s trademark style, this old Indian film poster features stunning hand painted artwork. Actress Prema Narayan is seen in a fabulous hand painted portrait at the center in a naughty pose. Comedian Jagdeep is seen in a hilarious avatar at the bottom of this vintage Bollywood poster for sale.